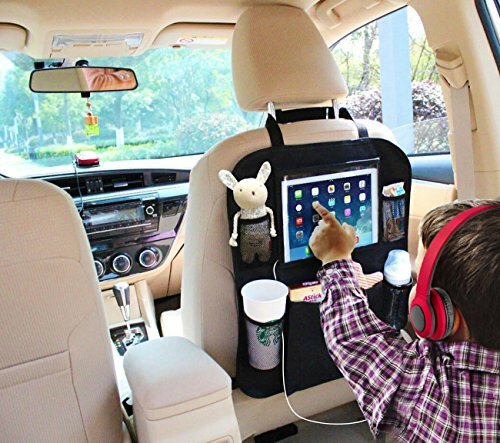 iPad car holders can simplify your life by turning your vehicle into a traveling office or an entertainment system. Designs range from front seat holders, that create a mobile workspace for you, to backseat holders that create a traveling entertainment system for you and your passengers. Front seat holders put your iPad at your fingertips so your apps are available to you at all times. Backseat holders give your passengers, young and old, safe access to games, movies and music on short or long trips. Below are the ten best designs available today. iKross 2-in-1 Tablet and Cellphone Adjustable Swing Extended Cup Mount Holder Car Kit iPad or tablet with screen size ranging from 7" to 10.2"
The TFI Holder mounts to the back of your car’s headrest for backseat entertainment. This holder comes with three simple parts; an adjustable velcro strap, a top mount and a bottom mount and can be used with or without a protective case. Wrap the strap tightly around the headrest, attach the top and bottom mounts and it’s ready for use. With just three parts, installing and removing your iPad is simple enough for a child to use. 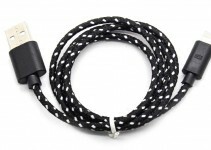 There are no protruding parts so getting in and out the car is simple and safe for your iPad. 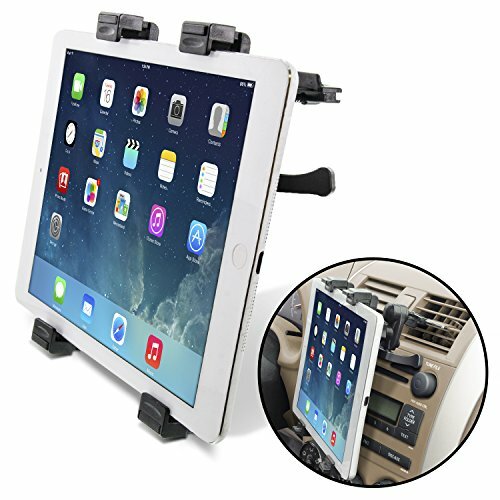 Because the holder mounts on your headrest, your iPad is safe from kicking feet and spills. 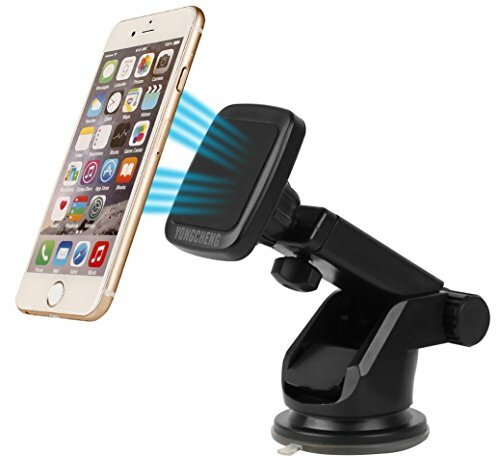 This magnetic mini holder from Yongcheng mounts to your dash to use your iPad mini or iPhone for a GPS or for your passenger to play games or watch a movie. 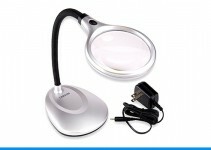 This three part system comes with a suction mount, a sticky pad, and a magnetic grip. The suction mount attaches firmly to your dashboard or windscreen. The removable sticky mount creates a solid mounting base for nearly all flat surfaces. 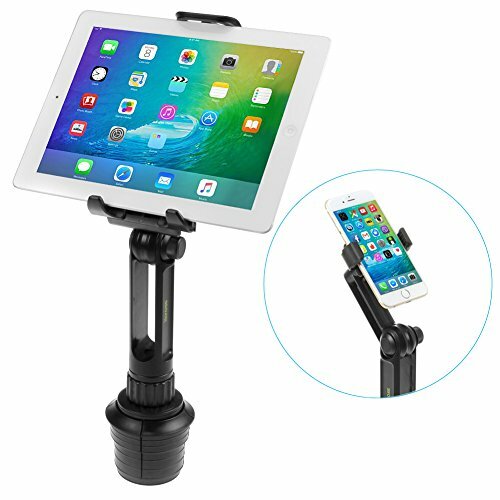 The magnetic grip makes single hand mounting or removal of your device simple. The cradle allows for 360-degree rotation for the perfect view in portrait or landscape. The iKross is designed to fit most cup holders and will hold tablets 7 to 10.2 inches. The simple design needs no tools for installation. The adjustable base twists to fit in a car, truck or SUV cup holder. The mount swing arm provides stability and shock absorption on bumpy roads, in addition to a full range of motion for multiple viewing angles. With 360-degree rotation, your passenger can comfortably read, watch a video or play a game. The Gear Beast holder is easy to install with no tools. Mounting clamps attach securely to your headrest posts. Featuring a ball in socket design the Beast has a 360-degree rotation and up to a 45-degree angle for the best viewing angle for backseat passengers. When you have your angle just right, set the tightening knob to prevent slipping and loss of angle. The bracket arms adjust to hold tablets from 7 inches to 10.2 inches. 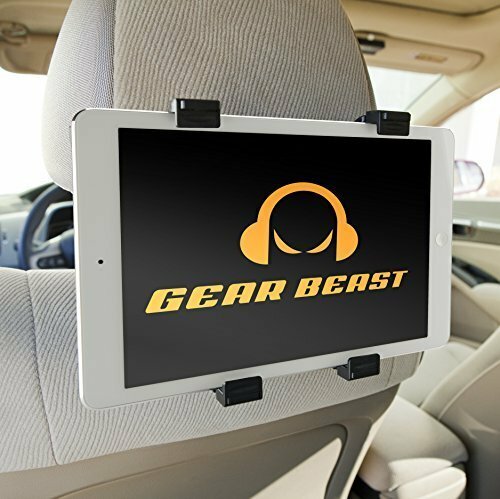 The Beast is made of ABS plastic and can be attached to the driver or passenger seat headrest. The bracket arms have extra cushioning for added grip, a secure hold and shock absorption. The special design of this model allows for air vent installation with no damage to your air vent. 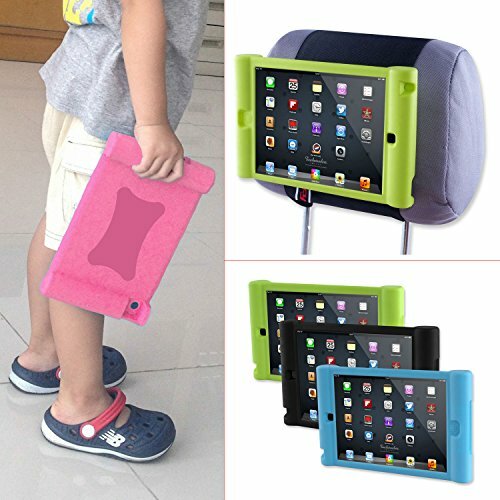 The special design keeps your iPad safe and secure. A Ballhead gives 360-degree rotation for portrait or landscape viewing, keeping your tablet at eye level and ready to use. The side grip design keeps all buttons and ports fully accessible while allowing quick release and easy mounting. 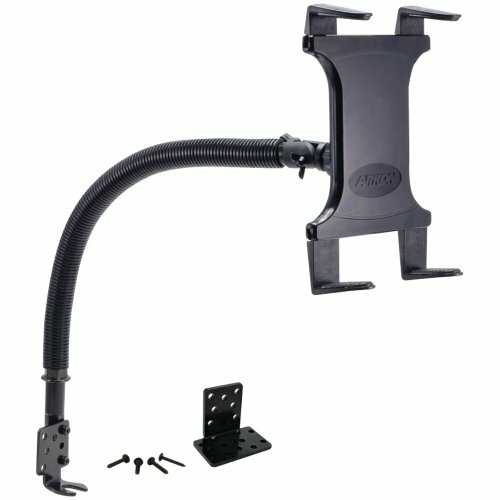 This holder is a more permanent solution and is recommended for fleets, service vehicles and trucks. 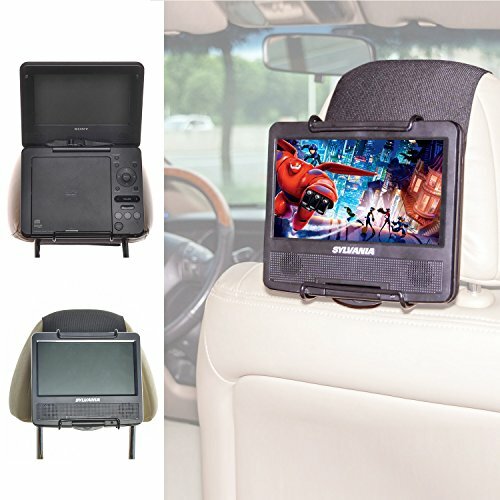 The car or truck seat rail or floor mount can accommodate tablets ranging in screen size from 8.9 inches to 12.9 inches. The Slim-Grip Universal Tablet Holder is spring loaded for one-handed placement and removal of your iPad. The adjustable leg design helps keep side buttons and ports clear for easy use. The 18-inch flexible gooseneck allows for perfect positioning. Installation is still relatively easy with minimal tools to install the mount to the car’s seat rail. Simply loosen the passenger seat track bolt, insert the included seat track bolt bracket and re-tighten the bolt. Optional floor brackets are also included for screwing directly into the floor of the vehicle. Please be warned drilling into a vehicle’s floor could cause damage to the vehicle. Use caution and consult a professional to avoid drilling into any of sensitive components. Anyone who travels with children will appreciate this holder. 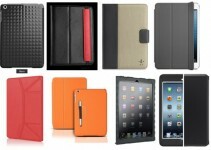 This holder addresses a whole set of issues while keeping your iPad safe and secure. In addition to the protective iPad pocket, there are two mesh bottle holder pockets and three small mesh pockets for holding snacks, toys or other personal items. The iPad pocket has an easy to clean surface for clearer viewing and easy access to the screen of your iPad. Installation is simple with adjustable straps and quick-release buckles, you simply strap it around the front seat headrest and buckle it on. 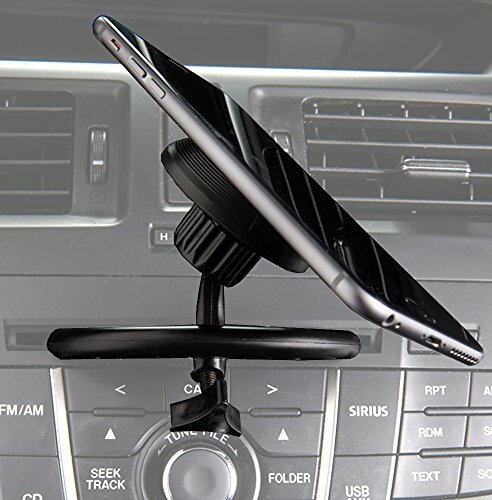 This portable car mount is easy to assemble with no hard plastic parts. The simple two-part design makes loading and unloading your iPad quick and easy. The 27.5-inch strap fits around most headrest or headrest posts. The sturdy PU leather case with velcro tab holds your iPad securely in place. Port and charger connections are easy to access. High mounting keeps your iPad safe and secure while still allowing easy removal. This unique holder is placed directly into your CD player to create a powerful and secure holder. This two part system comes with a CD blade and two metal plates. The CD blades inserts directly into your CD player creating a very stable mount that prevents unwanted movement. A powerful magnetic pad creates a strong grip on your device. The pad has 360-degree rotation for easy positioning. There are two ways to use the metal plates. One plate has an adhesive backing for permanent placement on your device. The second plate has no adhesive and is placed inside your iPad case to create a strong mounting surface. The CD blade won’t damage your CD player and doesn’t interfere with the functionality of your CD player. This colorful holder was designed with kids in mind. The two-part system is simple to install. A wide, adjustable velcro band wraps tightly around your headrest and a soft silicon case holds your tablet securely. The case has easy to hold side grips and bulged out corners for little hands to grip. 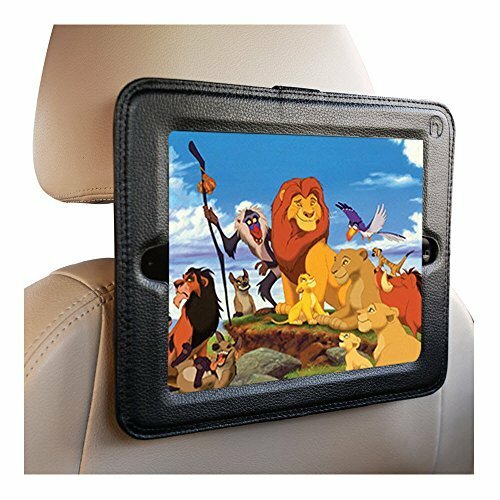 Place your iPad in the case and attach to the velcro band for easy backseat viewing and quick removal. The silicon case has easy access to all ports and buttons. The case also protects against accidental falls, scratches, and fingerprints.